Researchers in France are calling their six-legged creation the “AntBot.” This 9-inch robot doesn’t just skitter around like a desert ant, though—it also borrows their unique navigational skills. These skills, showcased in a new study published in Science Robotics on Wednesday, could someday allow robots to find their way back home without the need of conventional tracking techniques like GPS. Insect or arachnid-based robots aren’t exactly a new thing. Legged robots, as opposed to those on wheels, are better at traversing rough terrains. But the researchers behind the AntBot, based at the Aix-Marseille University in the South of France, turned to two very distinct species of foraging ant for inspiration in their design: Cataglyphis fortis of the Sahara and Melophorus bagoti of Central Australia. According to lead author Julien Dupeyroux, an engineer and PhD student in Biorobotics at Aix-Marseille, desert ants travel great distances in search of food, but they can’t use their sense of smell to return home, thanks to the scorching environments they live in. But they’ve found ways to compensate. In other words, the ants use a variety of tricks to help them figure out and remember where their homes are in relation to their current location—an ability scientists call path integration (when people do this, it’s called dead reckoning). Ants’ compound eyes, for instance, contain unique photoreceptors that capture ultraviolet light from the Sun that’s become polarised by scattered air molecules. This pattern of UV light, however, changes as the sun moves across the sky. By tracking these shifting patterns, the ants essentially have an internal, celestial compass that lets them determine which direction they’re facing. The same technique might even have been used by Viking sailors in the sea to navigate on cloudy days. They can also track how fast the ground appears to be moving across their eyes, which is known as optic flow (next time you’re in a car or bike, for example, just pay close attention to how the world seems to be moving past you—that’s optic flow). Optic flow, along with the ants’ awareness of how many steps they’ve taken during a walk, allows them to estimate how far they’ve travelled. Put that together with the celestial compass, and you’ve got a living, breathing homing device with six legs. 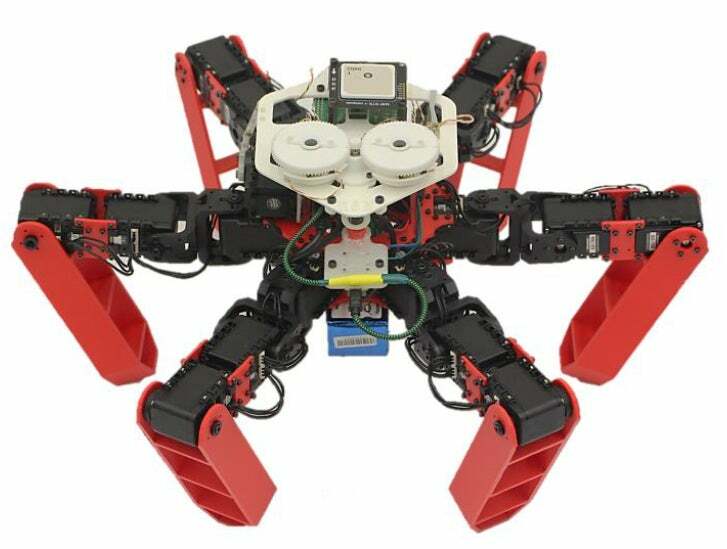 Dupeyroux and his team lifted these tricks, along with the ants’ strut, to create the 3D-printed, Raspberry Pi-led, fully autonomous AntBot. Then they sent the bot out to randomly walk around for a short while in a variety of environments, before asking it to return back home. The AntBot was decent enough at finding the quickest way back home using just one or two of the ants’ tricks, but when all three were combined, it was almost flawless. The findings suggest the AntBot doesn’t exactly “think” quite like an ant, in part because we don’t fully understand how desert ants use all of their navigational cues. But the nearly perfect performance of the AntBot is still impressive, Dupeyroux said, especially since it was done with relatively inexpensive tech and materials. Originally, he estimated, it could have cost upward of £66,000 to create a bot with an array of sensors that mimicked the ant’s compound eyes completely. But the bot’s less-complex sensors were still able to replicate the unique photoreceptors used for the celestial compass; they also helped drive down the final cost of designing and producing the AntBot to around £390. “We showed that our solution is biologically plausible, and that it has outstanding results as well.” he said. The navigational know-how displayed by the AntBot could someday be put to good use in technologies like last-mile delivery drones or smart cars, Dupeyroux said. Ideally, these robots would use a combination of different methods to navigate on their own, including GPS. But the AntBot’s bag of tricks could provide some advantages over existing methods in certain situations. “Though the GPS has a great impact in worldwide navigation, it suffers from several limits,” Dupeyroux said. These include signal failure when around tall buildings; a relatively small area of accuracy for smaller devices like smartphones, and not being particularly good on cloudy, rainy, or snowy days. The AntBot and robots like it should, at least in theory, be able to work around these limits. For now, though, there’s still plenty of work to be done in improving the robot.